T ourmaline’s name comes from the Sinhalese word ‘turmali’, which means ‘mixed’. Bright rainbow collections of gemstone varieties were called ‘turmali’ parcels. Tourmaline, occurring in more colours and combinations of colours than any other gemstone variety, lives up to its name. There is a tourmaline that looks like almost any other gemstone! Many stones in the Russian Crown Jewels from the 17th century, once thought to be rubies, are actually tourmalines. Perhaps this is why this gemstone is said to encourage artistic intuition: it has many faces and expresses every mood. The Empress Dowager Tz’u Hsi, the last Empress of China, loved pink tourmaline and bought almost a ton of it. The Dowager went to rest eternally on a carved tourmaline pillow. Tourmaline occurs in every colour of the rainbow and combinations of two or three colours. Bicolour and tricolour tourmalines, with bands of colours, are very popular. Sometimes the colours are at different ends of the crystal and sometimes there is one colour in the heart of the crystal and another around the outside. In 1989, miners discovered tourmaline unlike any that had ever been seen before. The new type of tourmaline, which soon became known as Paraiba tourmaline, came in incredibly vivid blues and greens. There are many unique properties of tourmaline. First, they are piezoelectric, which means that when a crystal is heated or compressed (or vibrated) a different electrical charge will form at opposite ends of the crystal (an electrical potential). Conversely, if an electrical potential is applied to the crystal, it will vibrate. It becomes a polarized crystalline magnet and can attract light objects. This property was noticed long ago, before science could explain it: in the Netherlands, tourmalines were called ‘aschentrekkers’ because they attracted ashes and could be used to clean pipes! Secondly they are pleochroic, which means that the crystal will look darker in colour when viewed down the long axis of the crystal than when viewed from the side. This property goes beyond the idea that the crystal is just thicker in that direction. Even equally dimensioned crystals will demonstrate this trait. Tourmaline is a favourite among crystal therapists. Their rich and varied colours can captivate the eye and enhance the senses. 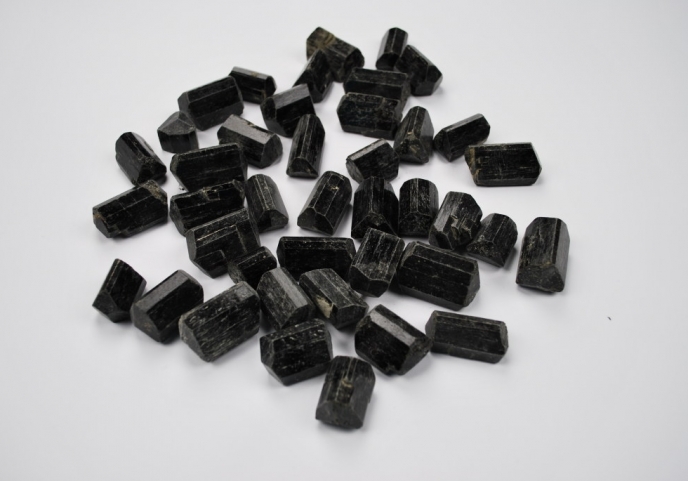 Even the black opaque tourmaline can produce sharp crystal forms. Tourmalines are cut as precious gems, carved into figurines, cut as cabochons or sliced into cross-sections, and natural specimens are enthusiastically added to crystal therapists’ healing collections. The tourmaline family as a whole gives off a very focused directional energy; this can be very useful when one wishes to ‘work’ within a particular chakra that may be too open, blocked, distorted, or split. They can still be used for body layouts to direct the energy flow; they are also good for moving energy between the chakras. For working on the meridian system you need to point the termination in the direction you wish the energy to flow. They also make exceptionally good meditation stones and are used to make wonderful healing gemstone essences. Gives protection from negativity and heavy energies. It has been used to deflect the negative energy from all electrical equipment and especially computers. It also grounds heavy, stagnant or negative energy; as with all tourmalines it is very directional. It has been used as an energy deflector, as it is an excellent stone for those with potential for exposure to excessive amounts of radiation. It will protect against the negative thought forms and even the evil ‘eye’ of another. It has been used to help people after operations and chemotherapy. It is used for problems of the spine, feet, legs and for nervous disorders. It is also good for kidney and adrenal problems.